Pool Chemicals & Testing. Spa Chemicals & Sanitizers. Sign up to receive special insider notifications of deals, promotions, and new items! Hayward Universal H-Series 500k BTU Low-NOx Propane Pool & Spa Heater H500FDP. Hayward Universal H-Series 500k BTU Low-NOx Propane Heater. The Hayward H500FDP Universal H-Series is a totally new gas heater design that combines industry leading hydraulic performance, environmentally responsible low-NOx emissions and superior reliability with the installation flexibility to easily adapt to new or existing pools and spas for what just might be the most perfect combination of features and benefits ever offered in an in-ground pool and spa heater. Environmentally responsible low NOx emissions. 2″ x 2 1/2″ CPVC union plumbing fittings. Managed cupro nickel heat exchanger flow. Independent left or right side electric, water and gas connections. Front panel access for installation and service. Questions about this item? To make sure we get the order to you as fast as possible, orders are processed as soon as they come in. We cannot guarantee that any order can be cancelled once placed and processed. Included in this but not limited to are Heat Pumps, Gas Heaters, Large Filters, Slides, and Diving Boards. These products are delivered to the front of the driveway, not to the garage or installation site. The trucking company is not responsible to transport your items anywhere other than the front of your driveway. In this circumstance, we will call you with the additional charges. To help make this process as smooth as possible please follow these guidelines. Sign Bill of Lading (receiving bill). This document says that the order has been received. This all states that the order has arrived in good condition. It is the customer’s responsibility to inspect all packages received. This document also states the number of cartons you are receiving, please make sure this number is the same as the actual number of cartons received. It is your responsibility to make sure your order is in good condition upon receipt. Backyard Pool Superstore is here for all of your pool and backyard needs. Here at Backyard Pool Superstore, we understand that mistakes can be made. The packaging must be resealed with. See below for more details. When you sign for the product, you state the product arrived in good condition, and you accept the condition it was delivered in. Our staff is dedicated to making sure your experience with us is not only good, but the best! We are not just “Internet retailers”, we are pool and backyard professionals that have been in business for over 20 years. We pride ourselves on fast, professional customer service. We use the latest technology to assist you with your pool, spa, patio, and backyard needs. The Best Customer Service and Expert Advice. With many years of experience in all aspects of the pool and backyard industry, we are here to help you with all of your questions. If one of our staff members cannot help you immediately, we will not rest until we find an answer to your question. The item “Hayward Universal H-Series 500k BTU Low-NOx Propane Pool & Spa Heater H500FDP” is in sale since Thursday, August 9, 2018. This item is in the category “Home & Garden\Yard, Garden & Outdoor Living\Pools & Spas\Pool Equipment & Parts\Pool Heaters & Solar Panels”. The seller is “backyardpoolsuperstore” and is located in Multiple Locations. This item can be shipped to United States. Hayward Universal H-Series Natural Gas Low NOx Pool Heater 500K BTU H500FDN. Natural Gas Inground or Aboveground Swimming Pool Heater. Hayward Universal H Series 500K BTU Natural Gas Pool Heater features universal fit flexibility as well as advanced technology. Ideal for both new and existing installation. Hayward H Series pool heater offers left-side or right-side electric, gas and water connections, with 110v or 220v electric hook up. Industry leaders in thermal efficiency. Stainless steel burners, corrosion-resistant heat exchangers and insulated combustion chambers for significantly reduced heat loss and superior performance. Digital LED control panel allows for easy, effortless operation. Built to last, Hayward Universal H Series pool heater utilizes Silicon Nitride Hot Surface Igniters and Cupro Nickel Heat Exchangers for superior durability. Low NOx heater which meet all current California and Texas air quality standards. NOTE: This heater is for residential use only. Free Lift Gate Service Included With This Item! Oversized deliveries are curbside only with FREE Lift Gate Service. We are unable to make changes or cancellations to orders after they are placed. If the combined weight of your order is 500 lbs. The item “Hayward Universal H-Series Natural Gas Low NOx Pool Heater 500K BTU H500FDN” is in sale since Tuesday, March 13, 2018. This item is in the category “Home & Garden\Yard, Garden & Outdoor Living\Pools & Spas\Pool Equipment & Parts\Pool Heaters & Solar Panels”. The seller is “intheswimpoolsupplies” and is located in United States. This item can be shipped to United States. Spas & Hot Tubs. Hayward Universal H Series Natural Gas Pool Heater. Hayward Universal H Series 500K BTU’s – Natural Gas Inground or Aboveground Swimming Pool Heater. THE PERFECT HEATER FOR ANY POOL APPLICATION! Hayward Universal H Series pool heater features universal fit flexibility as well as advanced technology. Ideal for both new and existing installation. Hayward H Series pool heater offers left-side or right-side electric, gas and water connections, with 110v or 220v. Ndustry leaders in thermal efficiency. Stainless steel burners, corrosion-resistant heat exchangers and insulated combustion chambers for significantly reduced heat loss and superior performance. Igital LED control panel allows for easy, effortless operation. Built to last, Hayward Universal H Series pool heater utilizes Silicon Nitride Hot Surface Igniters and Cupro Nickel Heat Exchangers for superior durability. Low NOx heater which meet all current California and Texas air quality standards. NOTE: This heater is for residential use only. Free Lift Gate Service Included With This Item! If you order this product, you will be contacted by the shipper within 24 hours of the. Customers who have shopped with us before can tell you. Specialty Pool Products. Offers the finest, most innovative and most effective items for your pool, spa, backyard and home. We only sell products that meet our strict standards for quality, function and value. And there’s more… Specialty Pool Products also promises you. We are unable to make changes or cancellations to orders after they are placed. Oversized deliveries are curbside only with FREE Lift Gate Service. If the combined weight of your order is 500 lbs. At SPP, your satisfaction is always our primary concern. Ready to order, need help or have questions? During peak times our response may be delayed as we do receive hundreds of emails daily. If you are in need of immediate assistance please call, our reps are available during the hours shown above on our banner. We hold ourselves to the highest standards and value the trust you place in us. We pledge not to share this information with other organizations for commercial purposes. Specialty Pool Products does not rent or sell its customer list. The item “Hayward H500FDN Universal H-Series Natural Gas Low NOx Pool Heater 500K BTU’s” is in sale since Thursday, April 06, 2017. This item is in the category “Home & Garden\Yard, Garden & Outdoor Living\Pools & Spas\Pool Equipment & Parts\Pool Heaters & Solar Panels”. The seller is “poolproducts.com” and is located in United States. This item can be shipped to United States. Hayward 500K Universal H-Series Natural Gas Pool Heater. The ability to take the chill out of your pool water, and heat it to the “just right” temperature is a very important factor in enjoying your swimming pool. Plus, in today’s environment of’going green’, we should all try to do our part to reduce emissions and help save our planet. Hayward’s Universal H-Series Pool Heaters were created with just these issues in mind. It’s the perfect Pool Heater for both new and existing installations. Enjoy a warmer pool this season without your fuel costs skyrocketing. Hayward’s Universal H-Series heaters represent innovative heating technology for pools and spas. Its hydraulic performance also saves energy by reducing the circulation time of the pump. It can raise the temperature of an 800 gallon pool 30 degrees in less than an houryou’ll feel the benefits the moment you step into the water. This approach to heating your pool is an efficient use of energyshowing once again our commitment to developing earth-friendly products. Other performance and efficiency-enhancing advances include stainless steel burners, corrosion-resistant Finn Plate heat exchangers with Cupro nickel, and insulated Fire Tile combustion chambers. This traps the heat unlike other forms of insulation delivering the highest degree of performance from every BTU. Equipped with an LED control panel it monitors heater performance for added convenience and maximum comfort with minimum effort. The ignition system delivers dependable lighting and reliable operations with just a touch of a button. The forced draft system constantly moves air through the combustion chamber to eliminate all outside weather variables affecting heating performance, such as wind conditions, eliminating the need to install a high-wind stack. Additionally, the Universal H-Series heater is easy to install and combines advanced technology with universal-fit flexibility making it virtually compatible with any new or existing equipment pad. This heating mixture sustains your swimming season, adds to your comfort, is energy efficient, and reduces your fuel costs. This low NOx emissions heater is perfect for you and the environmentall at the same time. New Design Provides “Universal Fit” Flexibility, for New & Existing Pools. Independent Left or Right side Electric, Water & Gas Connections. Hydraulic performance reduces the circulation time of the pump, saving energy & utility costs! Industry-leading 83%-84% thermal efficiency! Raises the temperature of an 800-gallon pool by 30 degrees, in less than an hour! 2″ x 2-1/2″ CPVC union connections. Heaters can be connected to either 110v or 220v power. Efficiency-enhancing features include stainless steel burners, corrosion-resistant heat exchangers with cupro nickel and insulated fire tile combustion chambers. LED control panel allows for easy, convenient monitoring of heater performance. Advanced Technology, for Superior Durability & Efficiency. Exclusive ignition system delivers dependable lighting and reliable operation – every time – with just a touch of a button. Digital LED control panel maintains water temperature and monitors performance for added convenience and maximum comfort – with minimum effort. Built to last, with a Cupro nickel Heat Exchanger for corrosion resistance and erosion protection (making it the perfect selection for salt-based pools). Forced draft system automatically moves air through the combustion chamber at a precise flow rate, eliminating weather variables that can affect heating performance, WITHOUT having to install a high-wind stack! Engineered with an insulated Fire tile Combustion Chamber that traps heat (unlike older forms of insulation) delivering the highest degree of performance from every BTU. Hayward Universal H-Series heaters meet the NOx emission standards set by the California South Coast Quality Air Management Commission for 2001 and the Texas Natural Resource Conservation Commission Code. Universal H-Series Pool Heaters are Certified Low NOx. Hayward Universal H-Series Pool Heaters are environmentally friendly, with lower running costs, too! All Universal H-Series units meet the NOx Emission standards set by the California South Coast Quality Air Management Commission for 2001 and the Texas Natural Resource Conservation Commission Code. We are unable to make changes or cancellations to orders after they are placed. We do not offer local pickups. Box & APO/FPO Addresses. Oversized deliveries are curbside only with FREE Lift Gate Service. If the combined weight of your order is 500 lbs. TO RETURN MERCHANDISE PLEASE FOLLOW THESE INSTRUCTIONS. Any item(s) received after 30 days will be denied and sent back to the customer at their expense. Not all items may be returnable. For example: Chemicals, Custom/Special Orders, Unfolded Covers, Opened Aboveground Liners, Drilled Solar Reels and Custom Commercial Furniture are all non-returnable. After 15 days all manufacturers warranties apply. Deliveries should be inspected and any visible damage should be notated prior to accepting the package. All damage claims must be submitted within 7 days of receipt by the customer, or a claim cannot be submitted. Insure the package for its full value. West Chicago, IL 60185. The item “Hayward 500K BTU’s Universal H-Series Natural Gas Low NOx Pool Heater H500FDN” is in sale since Thursday, April 06, 2017. This item is in the category “Home & Garden\Yard, Garden & Outdoor Living\Pools & Spas\Pool Equipment & Parts\Pool Heaters & Solar Panels”. The seller is “saveonpoolsupplies” and is located in United States. This item can be shipped to United States. In titles & description. 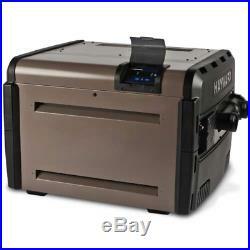 Hayward Universal H-Series Propane Low NOx Pool Heater 500K BTU H500FDP. Propane Inground or Aboveground Swimming Pool Heater. Hayward Universal H Series 500K BTU Propane Pool Heater features universal fit flexibility as well as advanced technology. Ideal for both new and existing installation. Hayward H Series pool heater offers left-side or right-side electric, gas and water connections, with 110v or 220v electric hook up. Industry leaders in thermal efficiency. Stainless steel burners, corrosion-resistant heat exchangers and insulated combustion chambers for significantly reduced heat loss and superior performance. Digital LED control panel allows for easy, effortless operation. Built to last, Hayward Universal H Series pool heater utilizes Silicon Nitride Hot Surface Igniters and Cupro Nickel Heat Exchangers for superior durability. Low NOx heater which meet all current California and Texas air quality standards. NOTE: This heater is for residential use only. Free Lift Gate Service Included With This Item! Digital Control Panel provides digital temperature readout and diagnostics for quick identification of components that might need service. Polymer header provides hydraulic performance to save energy and protect against the damaging effects of erosion from high flow conditions for improved reliability. Meets the NOx Emission standards set by the California South Coast Quality Air Management Commission for 2001 and the Texas Natural Resource Conservation Commission Code. All Hayward heat exchangers are now constructed with highly resilient Cupro Nickel for greater durability and longevity. Our patented single header “V” baffle design heat exchangers allow for long life, fast heating and virtually no condensation. With a low profile appearance, lighter weight design. Independent left or right side electric, water and gas connections plus 2 x 2 1/2 in. CPVC union connections to provide the ultimate installation flexibility for new or existing equipment pads. Forced draft system that constantly moves air through the combustion chamber at a precise flow rate. As a result, all outside weather variables that can affect the heating performance, such as wind conditions, are eliminated – without having to install a high-wind stack. The item “Hayward Universal H-Series Propane Low NOx Pool Heater 500K BTU H500FDP” is in sale since Wednesday, February 10, 2016. This item is in the category “Home & Garden\Yard, Garden & Outdoor Living\Pools & Spas\Pool Equipment & Parts\Pool Heaters & Solar Panels”. The seller is “intheswimpoolsupplies” and is located in United States. This item can be shipped to United States. In titles & description. 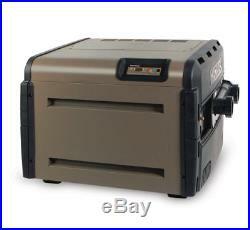 Hayward Universal H-Series Natural Gas Low NOx Pool Heater 500K BTU H500FDN. Natural Gas Inground or Aboveground Swimming Pool Heater. Hayward Universal H Series 500K BTU Natural Gas Pool Heater features universal fit flexibility as well as advanced technology. Ideal for both new and existing installation. Hayward H Series pool heater offers left-side or right-side electric, gas and water connections, with 110v or 220v electric hook up. Industry leaders in thermal efficiency. Stainless steel burners, corrosion-resistant heat exchangers and insulated combustion chambers for significantly reduced heat loss and superior performance. Digital LED control panel allows for easy, effortless operation. Built to last, Hayward Universal H Series pool heater utilizes Silicon Nitride Hot Surface Igniters and Cupro Nickel Heat Exchangers for superior durability. Low NOx heater which meet all current California and Texas air quality standards. NOTE: This heater is for residential use only. Free Lift Gate Service Included With This Item! Digital Control Panel provides digital temperature readout and diagnostics for quick identification of components that might need service. Polymer header provides hydraulic performance to save energy and protect against the damaging effects of erosion from high flow conditions for improved reliability. Meets the NOx Emission standards set by the California South Coast Quality Air Management Commission for 2001 and the Texas Natural Resource Conservation Commission Code. All Hayward heat exchangers are now constructed with highly resilient Cupro Nickel for greater durability and longevity. Our patented single header “V” baffle design heat exchangers allow for long life, fast heating and virtually no condensation. With a low profile appearance, lighter weight design. Independent left or right side electric, water and gas connections plus 2 x 2 1/2 in. CPVC union connections to provide the ultimate installation flexibility for new or existing equipment pads. Forced draft system that constantly moves air through the combustion chamber at a precise flow rate. As a result, all outside weather variables that can affect the heating performance, such as wind conditions, are eliminated – without having to install a high-wind stack. The item “Hayward Universal H-Series Natural Gas Low NOx Pool Heater 500K BTU H500FDN” is in sale since Wednesday, January 27, 2016. This item is in the category “Home & Garden\Yard, Garden & Outdoor Living\Pools & Spas\Pool Equipment & Parts\Pool Heaters & Solar Panels”. The seller is “intheswimpoolsupplies” and is located in United States. This item can be shipped to United States.